Muslims’ engagement with government and politics is becoming more prominent in the United States and abroad on issues ranging from immigration and terrorism to charities and civil rights. This guide lists research centers, organizations and scholars with expertise on the growing role of Muslims’ interactions with government and politics. The Council on Foreign Relations offers a “backgrounder” on Europe and the integration of Islam that covers history and major issues confronting Muslims and the European countries in which they live. The Guardian posts an interactive timeline of the protests that occurred in the Middle East during the Arab Spring. The Carolina-Duke-Emory Institute for the Study of Islam is a joint project of three southeastern universities. Its principal focus is on Islam overseas. The Center for Contemporary Arab Studies at Georgetown University In Washington, D.C., describes itself as the only academic center in the U.S. that focuses only on the Arab world, from Morocco to the Persian Gulf. Osama Abi-Mershed is its director. Contact: abimerso@georgetown.edu, CCASINFO@GEORGETOWN.EDU, 202-687-5793, 202-687-5648. 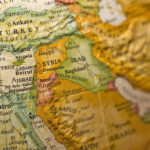 The Hagop Kevorkian Center for Near Eastern Studies at New York University in New York City focuses on the study of the Middle East, especially on its economies, cultures and politics. Helga Tawil Souri is executive director. Harvard University’s Islam in the West Program is a project of the university’s Center for Middle Eastern Studies. It focuses on the relationship between Islam and democracy in North America. Among the goals is to compare the attitudes of Muslims in Europe and Muslims in America. It conducts seminars, student workshops and surveys of Muslims and produces publications. The center is an interdisciplinary program in the Fulbright College of Arts and Sciences, dedicated to the study of the modern Middle East and the geo-cultural area in which Islamic civilization prospered, and continues to shape world history. The center at the University of Arkansas includes professors in a variety of disciplines. The Center on Islam, Democracy and the Future of the Muslim World is a program of the Hudson Institute in Washington, D.C. It hosts seminars and lectures and conducts research on the role of Islam in the politics and government of the Islamic world. Carolyn Stewart is the press secretary. The Center for Strategic and International Studies seeks to influence and develop international policy. It has a Middle East Program which focuses on U.S. foreign policy in the region. Its Turkey Project focuses on U.S. policy and Turkish politics. The South Asia Program focuses on the politics and strategic developments in India, Pakistan, Bangladesh, Sri Lanka, Nepal and Afghanistan. H. Andrew Schwartz is the chief communications officer. The Institute for Social Policy and Understanding is an independent nonprofit think tank committed to research and analysis of U.S. domestic and foreign policies, with an emphasis on issues related to the Muslim community in the United States. Media contact is Farhan Latif. The National Democracy Institute for International Affairs is a nonprofit organization that seeks to support democracies throughout the world. Its website is searchable by some countries. Kenneth Wollack is president. The Saban Center for Middle East Policy is based at the Brookings Institution, a nonprofit organization that focuses on U.S. foreign policy through funding independent research, publishing and events. It is based in Washington, D.C.
Yesim Arat is a professor of political science and international relations at Bogazici University in Istanbul, Turkey. She is the author of Rethinking Islam and Liberal Democracy: Islamist Women in Turkish Politics. Contact: araty@boun.edu.tr, 0 212 359 75 78. Azyumardi Azra is a history professor and rector of Syarif Hidayatullah State Islamic University in Jakarta, Indonesia. He is the author of numerous books, including Indonesia, Islam and Democracy: Dynamics in a Global Context. Gary R. Bunt is a scholar that specializes in topics relating to Islam, Muslims and the media; Islamic philosophy of law; Muslims in the U.K.; ritual and performance; religious and political authority. He is the author of Islam in the Digital Age. He writes a blog and maintains a website at Virtually Islamic. Contact: g.bunt@tsd.uwtsd.ac.uk, +44 (0)1570 424894. H.A. Hellyer is an associate fellow at the University of Warwick in Warwick, England, and a visiting fellow at the Brookings Institution’s Saban Center for Middle East Policy. He is an expert on Islam in Europe and has written several books on the subject, including Islam in Europe: Multiculturalism and the European “Other.” He can discuss Islam and politics in Great Britain. James Piscatori is a professor and deputy director of the Centre for Arab and Islamic Studies at the Australian National University in Canberra, Australia. He is formerly a senior scholar at the Oxford Centre for Islamic Studies in Oxford, England. He is a leading scholar in Islamic communities in the West. Contact: 02 6125 5001 / 0416 249 231. Naomi Sakr is a reader in communication at the University of Westminster in London, England. She is the author of Arab Media and Political Renewal: Community, Legitimacy and Public Life, which looks at the impact of Arab media on politics. Contact: n.sakr01@westminster.ac.uk, +44 020 7911 5000 ext. 4549. Contact: B.Tibi@sowi.uni-goettingen.de, +49 (0)551 / 39-7348. Mona Eltahawy is a speaker, writer and commentator who focuses on issues concerning Islam. She is based in New York City. Sohail Hashmi is an associate professor of international relations at Mount Holyoke College in South Hadley, Mass. He is an expert on Islam, pluralism, Islamic political thought and jihad. He posits that Islam lacks a tradition of political thought. Tawfik Hamid describes himself as a former member of an Islamic extremist movement Jamma’a Islameia who now speaks out for political and religious reform in the Muslim world. Bruce Hoffman is a professor in the security studies program at Georgetown University in Washington, D.C. He teaches graduate courses in terrorism and counterterrorism and insurgency and counterinsurgency, as well as other international security subjects. Sandra Mackey is a freelance journalist who has written widely on Islamic extremism, especially in Iraq and Lebanon. She is the author several books on Islam and politics in the Middle East including Mirror of the Arab World: Lebanon in Conflict (2008). She lives in Atlanta, Ga.
Michael Radu is co-chairman of the Center on Terrorism, Counter-Terrorism and Homeland Security at the Foreign Policy Research Institute in Philadelphia. He has studied terrorist groups around the world and is an expert on terrorism and extremism in Turkey. Gideon Rose is managing editor of Foreign Affairs magazine and an expert on terrorism, among other issues, in the Middle East and South Asia. He is based in New York City. As’ad AbuKhalil is a professor of political science at California State University, Stanislaus in Turlock, Calif. He is a frequent critic of U.S. foreign policy, especially in the Middle East. He writes the blog Angry Arab. Samer Shehata is an assistant professor at the Center for Contemporary Arab Studies at Georgetown University in Washington, D.C. He teaches courses on comparative and Middle East politics, U.S. policy toward the Middle East, Islamist politics, Egyptian politics and society, culture and politics in the Arab world. He is currently writing a book about the rise and fall of the Egyptian Muslim Brotherhood that is under contract with Stanford University Press. Frederick Streets is the Senior Pastor of the Dixwell Avenue Congregational United Church of Christ in New Haven, Conn. He contributed an article to the Feb. 22, 2008, issue of the journal Faith and International Affairs on the special role African-Americans can have in the building of bridges with Muslims overseas. Dale Eickelman is a professor of anthropology and human relations at Dartmouth College in Hanover, N.H. He and Jon Anderson are the editors of New Media in the Muslim World: The Emerging Public Sphere, which, in part, looks at how new media such as the internet influence politics in Muslim countries. Orayb Najjar is a professor of journalism at Northern Illinois University in DeKalb, Ill. She argues that the three Middle East news stations – Al Jazeera, Al Arabiyya, Al Manar – organize coverage around the question, “How should the Middle East be organized?” and that, as a result, they disseminate political news differently than other news stations. IslamiCity bills itself as “a global Muslim eCommunity” and offers everything from news and opinion to ecards and matrimonial services on its site. It is based in Los Angeles and owned by Human Assistance and Development International, a nonprofit organization. Mohammed Aleem is its CEO. Princeton Lyman is an adjunct professor of foreign service and an adjunct senior fellow in Africa policy studies at the Council on Foreign Relations in Washington, D.C. He is a former ambassador to South Africa and Nigeria and is an expert on democratization in sub-Sahara Africa. Haim Malka is a fellow and deputy director of the Middle East Program at the Center for Strategic and International Studies in Washington, D.C. He is an expert in Islam and politics, especially in the Middle East and North Africa. Jon B. Alterman is director of the Middle East Program at the Center for Strategic and International Studies in Washington, D.C. He is an expert on Middle East politics and was an adviser to the Iraq Study Group. Mohamad Bazzi is a fellow with the Council on Foreign Relations, where he is working on a project about Hezbollah and the Shiite community in Lebanon. He is the former Middle East bureau head for (New York) Newsday and is based in New York City. Nathan Brown is a professor of political science and international affairs and director of the Institute for Middle East Studies at George Washington University in Washington, D.C. He is an expert on government and politics of the Middle East, democratization and constitutionalism, and the rule of law in the Arab world. Steven Cook is a fellow at the Council on Foreign Relations who is knowledgeable about politics in the Arab world, U.S.-Middle East policy, civil-military relations in the Middle East and the Arab-Israeli conflict. Suzanne Maloney is a senior fellow at the Saban Center for Middle East Policy at the Brookings Institution in Washington, D.C. She is an expert on Iran and the Gulf States and has written about religion and human rights in the region. Vali R. Nasr is director of the Roundtable Series on Global Islamic Politics at the Council on Foreign Relations, where he is also an adjunct senior fellow for Middle Eastern studies. He is dean of the Paul H. Nitze School of Advanced International Relations at Johns Hopkins University and is an expert on Iran, Iraq, Pakistan, political Islam and democratization in the Muslim world. He is also the author of three books on Islam in the Middle East, including Islamic Leviathan: Islam and the Making of State Power. He is a professor of Middle East and South Asia politics at Tufts University in Boston. Read an October 2004 interview with Nasr conducted by Bill Moyers for the PBS television series Now. Itamar Rabinovich is a visiting fellow at the Saban Center for Middle East Policy at the Brookings Institution in Washington, D.C. He is a former president of Tel Aviv University and an expert on politics in the Arab world. Jean-Francois Seznec is a visiting associate professor at the Center for Contemporary Arab Studies at Georgetown University in Washington, D.C. He is an expert on democratization in the Persian Gulf region..
Shibley Telhami is a senior fellow at the Saban Center for Middle East Policy at the Brookings Institution and an expert on politics in the Persian Gulf and in the Israeli-Palestinian arena. He is also the Anwar Sadat Professor for Peace and Development at the University of Maryland in College Park. Tamara Cofman Wittes is a senior foreign policy fellow at the Saban Center for Middle East Policy at the Brookings Institution in Washington, D.C. She is director of the institution’s Middle East Democracy and Development Project. Hassan Abbas is a research fellow at Harvard University’s Belfer Center for Science and International Affairs in Cambridge, Mass. He is an expert on religious extremism in South and Central Asia and is the author of a book on extremism in Pakistan. Husain Haqqani is a senior fellow at the Center on Islam, Democracy and the Future of the Muslim World and director for the Center for International Relations at Boston University. He is the author of Pakistan: Between Mosque and Military. Bulent Aliriza is director and senior associate of the Turkey Project at the Center for Strategic and International Studies in Washington, D.C. He is an expert in Turkish politics and foreign relations. Zeyno Baran is an associate scholar at the Center on Islam, Democracy and the Future of Muslim World and a senior fellow and director of the Hudson’s Center for Eurasian Policy. She is an expert on Islam and politics in Europe. Jocelyne Cesari is a visiting associate professor of Islamic studies at Harvard Divinity School in Cambridge, Mass. She is the author of When Islam and Democracy Meet: Muslims in Europe and in the United States (2004) and director of Harvard’s Islam in the West Program. Jonathan Laurence is an assistant professor of political science at Boston College in Boston. He specializes in Muslim identity in Europe, especially in Germany and France. He has written widely about the integration of Muslims in France, including on the controversy of Muslim girls wearing hijab to public school. F. Gregory Gause III is a non-resident senior fellow at the Brookings Doha Center and the incoming John H. Lindsey ’44 Chair in international affairs at the Bush School of Government at Texas A&M University in College Station. He is an expert in Middle East politics and participated in “Roundtable Series on Global Islamic Politics: The Implications of the Changing Balance of Power in the Middle East” at the Council on Foreign Relations in October 2007. Mirjam Künkler is an assistant professor in Near Eastern studies at Princeton University in Princeton, N.J. She is also the former deputy director of the Center for the Study of Democracy, Toleration and Religion at Columbia University in New York, where her dissertation was on Islam and democracy. She is an expert on Islamic politics in Indonesia and Iran. Ellen Lust-Okar is an associate professor of political science at Yale University in new Haven, Conn. She researches the formation of political institutions in the Middle East. David Patel is an assistant professor of government at Cornell University. He applies game theory and ethnography to Islamic institutions to study their effect on national politics and once spent eight months living with an Islamic family in Basra, Iraq. He speaks frequently about the political and religious situation in Iraq. Diane Singerman is an associate professor at the School of Public Affairs at American University in Washington, D.C. She is an expert on Islam and politics in Egypt. Catherine Warrick is an assistant professor of political science at Villanova University in Villanova, Pa. She teaches a course in Middle East politics, and one of her areas of research and expertise is comparative politics in the region. Michaelle L. Browers is an associate professor in the political science department of Wake Forest University in Winston-Salem, N.C. Her expertise is in Arab and Islamic political thought, political ideologies, feminist theory and democratic theory. Najib Ghadbian is an assistant professor of political science and Middle East studies at the University of Arkansas in Fayetteville. Ghadbian’s research interests include political currents and media in the Arab world, Islamic movements, Syrian politics, and domestic and international politics in the Arabian/Persian Gulf. David Gilmartin is a history professor at North Carolina State University and director of its Center for South Asia Studies. He can discuss the politics in Pakistan. He is in Raleigh, N.C.
Khaled Helmy is a visiting professor in the political science department at Tulane University in New Orleans, where he teaches a course in the comparative politics of the Middle East. Clement Moore Henry is a professor at the Center for Middle Eastern Studies at the University of Texas at Austin. He is interested in comparative politics in the Middle East and North Africa. Timur Kuran is professor of economics and political science and Gorter Family Professor of Islamic Studies at Duke University in Durham, N.C. He has researched economic issues involving Islam, and his books include Islam and Mammon: The Economic Predicaments of Islamism (Princeton University Press, 2004). Michael Peletz is an anthropology professor at Emory University in Atlanta. He is an expert on Islam and politics in Malaysia, Indonesia and other parts of Southeast Asia. Leonardo A. Villalón is an associate professor of political science at the University of Florida in Gainesville and director of its Center for African Studies. He is at work on a project for the Carnegie Corporation of New York titled “Negotiating Democracy in Muslim Contexts: Political Liberalization and Religious Mobilization in the West African Sahel.” He is an expert in Islam and politics and on democratization in Senegal, Mali and Niger. Fred von der Mehden is a professor emeritus of political science at Rice University in Houston. Islam and the politics of Southeast Asia are among his fields of interest. Orit Bashkin is an assistant professor of modern Middle Eastern Studies at the Center for Middle Eastern Studies at the University of Chicago. She is an expert on the political and religious history of Iraq. Anas Malik is an assistant professor of political science at Xavier University in Cincinnati. He does research on political Islam and development and participated in a panel on why Islam becomes politicized at the 2007 Clifford Symposium “Islam and Politics in a Globalizing World” at Middlebury College in Middlebury, Vt.
Mansoor Moaddel is a research affiliate at the Population Studies Center at the University of Michigan, where his focus has been on political attitudes and conflicts in the Middle East. Joel S. Fetzer is a professor of political science at Seaver College at Pepperdine University in Malibu, Calif. He co-wrote Muslims and the State in Britain, France, and Germany (Cambridge University Press, 2004). Ira M. Lapidus is a professor emeritus of history at the University of California, Berkeley. He is co-editor of the book Islam, Politics and Social Movements. You can read the transcript of a 2003 interview with Lapidus on the subject of contemporary Islamic societies and politics. Mark LeVine is a professor of history at the University of California, Irvine, where he specializes in the Middle East. He has written widely about Islam and politics, including on the subjects of Islam in the public square and Islam and Middle Eastern politics. Farid Senzai is a fellow and director of research at the Institute for Social Policy and Understanding, which researches the Muslim community in the United States. He is also an assistant professor of political science at Santa Clara University. A co-editor of Educating the Muslims of America (2009), he helped organized a 2006 conference on Islamic education in the United States. Mehran Tamadonfar is an associate professor and chairman of the political science department at the University of Nevada, Las Vegas. One of his areas of study is Islam and politics in the Middle East and North Africa.